Cut and scoop out avocado with a spoon, chop garlic and cilantro finely. Put avocado, garlic and cilantro into a bowl and mesh everything with a fork. Add olive oil, lemon juice, salt and pepper. Mix well and set aside. Marinate duck breast with salt and pepper. Pan fry without oil on the skin side for about 4 minutes or until golden brown then seal the other side for 30 second. Then place duck breast in a preheated oven (200 Celcius) for 8 minutes. Remove from oven, allow duck breast to rest for 5 minutes. this will allow the juice to settle. Mixed the finely chopped ingredients with seasoning sauce, oyster sauce, sweet Thai chili sauce, sesame oil and sugar. Pour all the sauce mixture over the duck breast and place duck breast together with sauce in fridge for at least an hour. Cut wonton skin into halves. Deep fried wonton skin one at a time by holding the wonton in the oil until it is firm before releasing it into the oil. 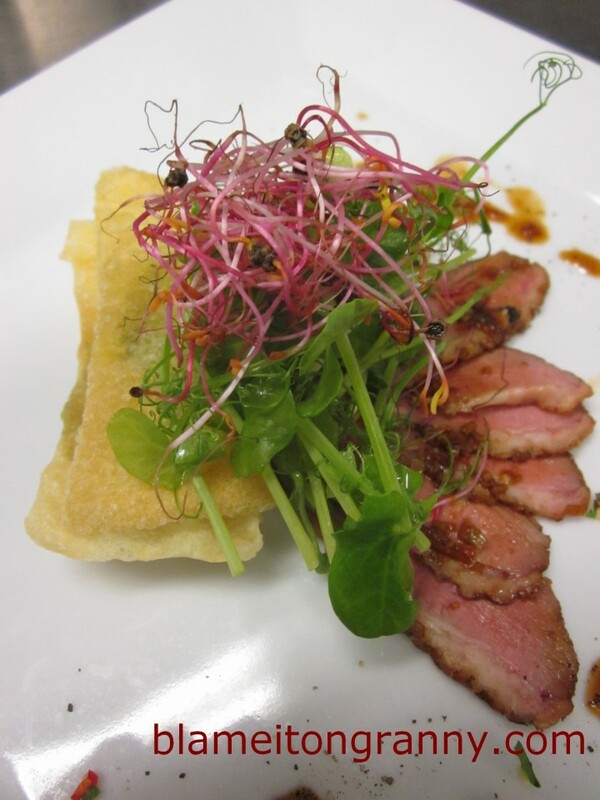 Slice duck breast very thin and arrange on a plate. Place deep fried wonton skin topped with 1 tsp of guacamole then wonton skin again with guacamole and finish with a piece of wonton skin on top. Drizzle a bit of the duck marinate over the duck breast and garnish plate of food anyway you prefer. Note: Tuong gia vi is a Vietnamese seasoning sauce but if you can’t buy that in your country, just use soya sauce but in lesser amount.